The trend setting sport of Nordic walking attracts newcomers year after year. Physical strength is no doubt a primary requirement, but so are vitality, degree of fitness and passion for nature. Nordic walking with walking sticks efficiently re-enforces your cardiovascular system and uses approximately 85% of your total body muscles. The Isarco Valley Mountains and stunning panorama are ideally suited for your Nordic walking vacation. Whether up on the mountain planes or down in the valley, practice this trendy sport anywhere. 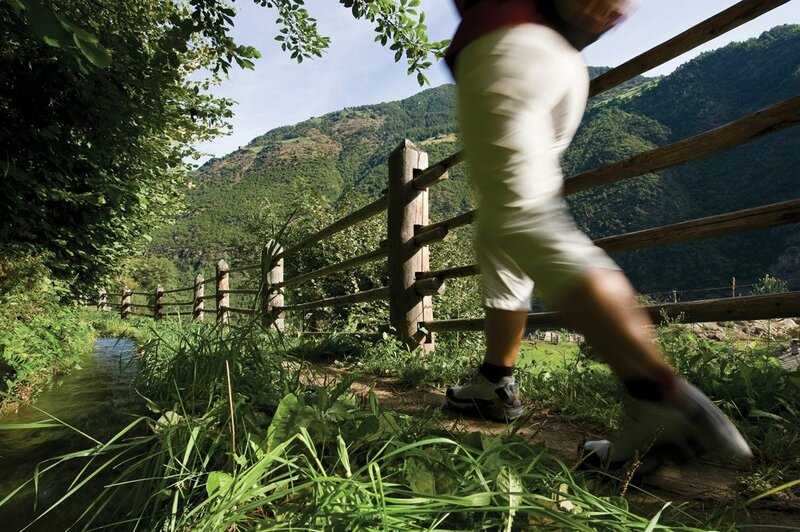 The recently new “Active Nature/Natura Attiva” park up on the apple plateau at Natz/Sciaves welcomes walking enthusiasts with a large selection of trails to choose from. Come up to Natz/Sciaves, the plateau of apple orchards and visit the Active Nature Park and its 80 km of Nordic walking trails and itineraries. This hillside town sits on flat, low-mountain land with rows and rows of apples, forests and a magnificent, one-of- a- kind view. Look down upon the historical city of Bressanone and far across the Isarco Valley. Look up and marvel at the grandeur of the Alp mountain chain. With 15 different itineraries, levels of difficulty, and scenic rest points to choose, Nordic walking keeps you on track. Group excursions possible during the months of May to October, early bookings recommended.